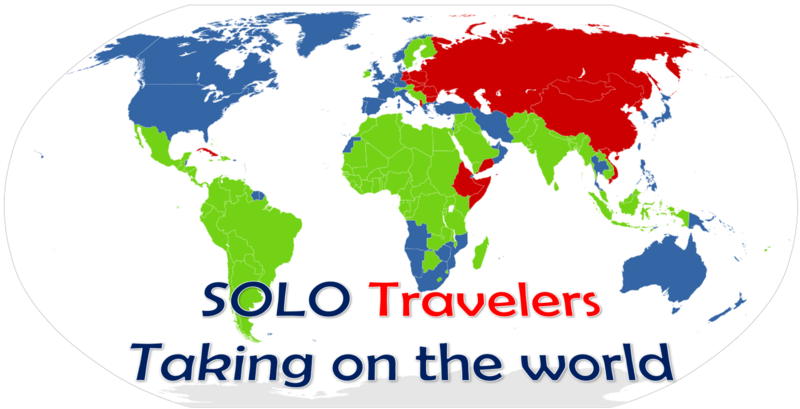 Welcome to our Solo Section, where we feature solo travelers traveling the world, who have joined our Road To 100 Countries travel movement. Meet Angie, she absolutely loves traveling and seeing different parts of the world. Angie tends to take the less touristy route and explores countries for two weeks to get to know the people, taste the local cuisine, embrace the culture, and learn the language as much as possible. Click here to follow Angie’s travel journey. Meet Brian, his motivation for documenting his travels extensively is to help reform the travel industry. Through his efforts, he hopes to break down the racial barriers when it comes to travel advertising. When he works with tourism boards or hotels, he wants to demonstrate that travel ads created can convert a high percentage of leads into sales. Thus, improving their bottom line. He also has the opportunity to prove that Black people are just as interested in travel as any other race if they can see someone who looks like them doing the type of travel that they long for. Therefore, by capturing vivid and striking images, Brian plans to help with the influence of the Black community to spend dollars in areas of travel that other races can’t. Click here to follow Brian’s travel journey. Meet Cassandra she was exposed to unique cultures at a young age. Being of Liberian and Jamaican descent, she’s always known there is so much beauty in the world outside of her native Dallas, TX. Immersing herself into the lifestyle and nuances of new cultures has provided perspective that makes her appreciate people from all walks of life.Traveling throughout the world has enriched her life in so many ways and allowed her to lead a joyful, cultured and fulfilling life. Click here to follow Cassandra’s travel journey. Meet Chanice, she loves to travel because it brings her peace. She gets to escape reality for a little bit and meet amazing souls, eat delicious food, make awesome new friends, and create memorable experiences that no one could ever take away from her. Traveling is something that allows her to get wiser and more open-minded towards other cultures and anything that is different than what she’s used to. If you were to ask her what happiness is, it’s simple travel! Click here to follow Chanice’s travel journey. Meet Elena, her love of traveling stems from her father who taught her at a young age that no matter how hard you work or busy life gets, there is always time to take a moment to travel and expand your horizons. Elena loves to immerse herself into new cultures, taste new cuisines and meet people from all walks of life. With every new city and country, comes a new adventure. She finds that travel is the best form of education, as it helps her develop a deeper understanding of the world and herself as an individual. Elena believes that traveling helps her grow spiritually and mentally; gain more confidence and develop a deeper sense of self. As a Licensed Social Worker, she always encourages her clients to practice self-care, as traveling is her form therapy and favorite method of self-care. There’s nothing like a post vacation glow! Elena’s ultimate goal is to combine her passion for travel and mental health wellness to continue to give back and help others. She hopes she can inspire others to step out of their comfort zones to gain a deeper understanding of the world and themselves. Carpe diem! Click here to follow Elena’s travel journey. Meet Elle, he believes that of all the books in the world, the best stories are found between the pages of a passport. His bucket list goal for travel is to touch every continent and as many countries, as possible. Traveling is so important to him for a variety of reasons. For starters, he enjoys embracing and being educated on the culture of the country. Being able to authentically try new foods, experiencing unique staple dishes specific to the place that he’s exploring, has always been something he looks forward to.. From a social stand point, Elle loves meeting new people, learning about their journey, what it’s like growing up in their country or what led them to where they are and sharing their differences and similarities, somehow just connects us as people. Seeing different parts of the world allows for him to humbly appreciate my life. All in all, these places and the people he meets along the way, are moments that he will cherish for the rest of his life and he can create these experiences through traveling the world. Click here to follow Elle’s travel journey. Meet Fabiana, growing up in a small town, she has always had the ‘travel bug.’ She has always wanted to explore different cultures, speak different languages and just immerse herself into parts of the world that she’s only seen on the television screen or read in books. Now that she’s a solo traveler, nothing in this world excites me more. Traveling pushes Fabiana to challenge herself and to determine her strengths and weaknesses. It provides her with opportunities to immerse herself into different cultures and to meet people from distinctive backgrounds and cultural surroundings contrary to her own. How she sees it, is that we live in this gigantic Milky Way, on this vast planet, with around 195 countries to explore and over 7.4 billion people to meet! Why stay secluded to one place? Click here to follow Fabiana’s travel journey. Meet Gael aka Gabbok. He’s been traveling for the past 10years and has visited over 108 countries thus far. Gabbok currently works in the Energy stock exchange market and creates a travel film company called Eyestell. So, he’s been traveling a lot with both his jobs. Gabbok speaks French, Swahili, Arabic, Italian and English and loves learning new languages on his travels. He also travels a lot with his 7yrs old daughter, who has been to 28 countries so far. Although Gabbok travels for work, he also tries travel for pleasure whenever he can. Getting lost in the unknown amazes him. Central Asia and the whole continent of Africa are his favorite playgrounds of choice. He often feels like the world is a big neighborhood, and you never know what or who is around the corner. Click here to follow Gabbok’s travel journey. Meet Graham, he loves to travel, because he loves having time to himself, experiencing new cultures, meeting new people and immersing himself out of his general comfort zone. His goals every time he travels is to make new friends, be a part of the culture and appreciate learning from diverse people with a hands-on approach. The vast memories of each trip always have something that leaves him appreciating the simplicity of each trip he takes. Travel is probably one of his greatest loves. Whether he’s abroad or taking on the adventures of a new city in the U.S. he’s always fulfilled and finds something new to always be in awe of. Click here to follow Graham’s travel journey. Meet J. Lee, he loves traveling, because he loves being intrigued with all the world has to offer. He moved to Dubai for work in late summer of 2017, and since then he’s have visited over 13 countries. While living in the states he traveled a great deal domestically but never had the opportunity to do any international travel. Now that he resides in the Middle East, traveling to other countries is more convenient and less expensive. Living abroad has also afforded him the opportunity to meet different people from different countries and cultural backgrounds. This has also sparked his interest in traveling more. His ultimate travel goal is to see all seven world wonders. So far, he has seen three with the hopes of seeing all seven by the end of 2020. Click here to follow J. Lee’s travel journey. Meet Jasen, traveling has always been something he’s wanted to do but of course with life happening so fast at times, it often took a back seat. So, in 2018, he consciously decided to change that. Traveling more was his 2018 New Year’s resolution. His initial plan was to target the 7 Wonders of the World. After his first trip to Iceland in May, the 7 Wonders endeavor then changed to literally wanting to go any and everywhere. Jasen was definitely bit by the travel bug and his eyes were wide open. Traveling is addictive. Jasen, loves experiencing new things and travel has been very insightful and refreshing. Fast forward to present day, and Jasen has been on 16 trips so far. He has learned to embrace new cultures and interact with people from all different walks of life. His travel experience has been very instrumental in his growth as a man, but more importantly, an African American man. Jasen tries to encourage folks to do the same by sharing his travel experiences through social media. His travel goals for 2019 are to actually complete is initial goal of visiting the 7 Wonders of the World. Click here to follow Jasen’s travel journey. Meet Jenette, her travel goals are to learn, experience and grow as a person. She aims to travel often and plans to go on more solo adventures. She also aims to inspire people to travel, as she thinks it’s vital for everything. The reason she finds traveling so attractive is because she learns new things, sees beautiful places, experiences new cultures and reflects on life after a journey. When Jenette initially decided she wanted to travel, it was to escape the realities of hardship in everyday life. Now, traveling has opened her eyes and made her so grateful for everything she has. Traveling as an experience has changed the way she thinks about the world, her life and the meaning of true happiness. Click here to follow Jenette’s travel journey. Meet Jennifer, she loves to travel because it makes me realize how small she is in such a big world. It makes her humbler and teaches her to appreciate everyday life. When traveling, she learns a lot about cultural values, and fully immerse herself into the atmosphere. When traveling, it lets her escape reality a little, and it reminds her to never stop traveling because the world is so beautiful and we only have a limited time to explore and indulge in it. She has only traveled to Asian countries so far, but she plans to travel to America and Europe in the upcoming years. Jennifer has fallen in love with London, Paris, Prague, the Amalfi Coast in Italy and Santorini in Greece, even though she hasn’t been there yet. Watch out world, she’s coming soon! Click here to follow Jennifer’s travel journey. Meet Jerry, he loves traveling because it is a constant learning opportunity. Not only do you learn about the cultures you explore, but you can also learn a ton about yourself, which is invaluable. Jerry’s return from every trip with new ideas and ways of thinking that he would have never have come up with at home. His travel goals right now are to continue encouraging more men of color to travel via his podcast Point Noir (@pointnoirshow ), and spending another few years living abroad in either Asia or Africa. Click here to follow Jerry’s travel journey. Meet Jojo, born in the Philippines, Jojo’s first plane ride was to the United States. The experience left an everlasting impression resulting in a desire to cross more borders and experience new and diverse places and people. For her, each flight is a blessing that’s full of new opportunities to decorate her soul, realize her passion, and fulfill a lifelong dream. It’s now clear, Jojo is fully committed to expanding her travels. She sees this as a way to learn and grow as a world citizen. This is her version of success. Not wanting to be compared with someone who sees success as the volume of work completed in life. Jojo, while being an entrepreneur, sees success and happiness in establishing human connections. She has been fortunate to meet and to share her soul with many on her journey. Click here to follow Jojo’s travel journey. Meet Kishon, her travels are her escape from her crazy busy world, and helps keep her super grounded and stress free. Kishon is pretty spontaneous with her travels. She believes she’s the perfect travel buddy anyone can ask for, you give her a date and an itinerary and she’s booking. She loves experiencing new cultures and lives for the life changing conversations and experiences with the locals she meets along the way. Kishon was also born in Trinidad and relocated to NYC at age 5. Her parents didn’t have the luxury of traveling the world. Therefore, her parents always told her to live her life to the fullest. Click here to follow Kishon’s travel journey. Meet Mylene, she lives in Paris, and because of the ease with the new low coast air company to travel Europe. She’s already visited Italy, Portugal, Spain, United Kingdom, Hungary, Czech Republic, and Germany. She has yet to explore Asia and hopes she will begin with Bali, Indonesia as one of her dream destinations. Mylene likes to travel to escape and think about other things than her job. She loves to visit cities and discover other cultures, landscapes, languages even if her French accent can make local people laugh. She absolutely loves the experience and can’t wait to see what the vast world has to offer. Click here to follow Mylene’s travel journey. Meet Narica, as a medical student traveling has become a bit difficult, because her schedule has changed a lot in the last year and it’s extremely difficult to make time. However, every chance Narica gets, she’s in a new location. Her travel plans include being a part of the 30 under 30 club; where she will visit 30 countries by the age 30. She is a lover of rich cultures and traveling allows her to learn about herself in different settings and the aim for personal growth. Narica is also a lover of food and trying different cuisines from all over the world is one of her favorite things to do. She will try everything at least once and that has brought her to trying a lot of interesting meals to say the least. She can’t wait for what new adventures await her on her travels. Click here to follow Narica’s travel journey. Meet Noelz, her goal is to travel as much as possible until her feet can’t carry her anymore. Noelz believes traveling exposes you to new environments that allow you to express a side of you that you never knew existed. She loves to travel for that reason alone. She is able to learn more about herself from others she meets along her travels. Travel helps you adapt, develop patience, and truly learn to love. Her goal is to go places people don’t usually explore, and she can’t wait to share this adventure with the world. Click here to follow Noelz’s travel journey. Meet Nocera, she has been traveling since she was 2 years old. Her first trip was to Jamaica to visit family. Every year her mom made sure to take her and her siblings to a destination outside of their home state. Nocera’s travel goal is to continue traveling every year to learn different cultures and explore this magnificent world that we are blessed to live in. Now, having a daughter of her own, she wants to raise her daughter to explore and love the world as much as she does. Click here to follow Nocera’s travel journey. Meet Samson, his travel goal is to travel to as many places of the world as possible. While traveling he intends to write a blog of each of his experiences in the hopes to inspire others to travel more. Samson believes travel can truly bring happiness and joy to one’s life, with a long-lasting memory of experiences, which is far more valuable than materialistic items. Click here to follow Samson’s travel journey. Meet Tatiana, ever since she could remember, she wanted to see the world. As a child, she remembers watching shows on National Geographic and Animal Planet and thinking to herself “I want to go there, I want to see that.” That mentality has stuck with her ever since. She has never been satisfied with only seeing far off places in books or on TV. She wanted to be there and experience it for herself, so she could make my own opinions based on her own impressions instead of relying on a stranger’s words in a book or documentary. The world is so much bigger than just you and your town. Travel opens your eyes to new cultures, cuisines, landscapes, and experiences. It expands your mindset, adds more sustenance to your interactions with people, and impacts your humanity towards the rest of the world. It puts life in perspective. Tatiana wants to show people the beauty of the world. She especially loves see places and sights that are off the beaten path. She believes travel doesn’t have to be expensive or out of reach, and people don’t have to quit their jobs to do it. She wants to inspire people to get up and get out and see the world. Don’t think, just do it. It will change your life for the better. Her travel goal is simple, to keep traveling as often as she can, to as many places as she can, and to see as much as she can. Click here to follow Tatiana’s travel journey. Meet Thérèse, she has been traveling since she was young thanks to her parents. Her goals as a traveler, solo or otherwise has always been to experience new cultures, new food and new adventures. She started doing a yearly solo trip about 4 years ago and found that traveling alone sometimes can not only help her achieve those goals but also gives her the time needed to refocus, refresh and release. Thérèse travel goals for the next 2-3 years will be visit all 7 Natural Wonders of the world, make it to 35 countries (or more) visited, and to make it to all 7 continents. Experiences are worth so much more than material things to her, and that is why she loves to travel! Click here to follow Thérèse’s travel journey. Meet Vanna, she’s currently visited 40+ countries, and lived in 6. Traveling for her is an incredible opportunity that she doesn’t take for granted. It’s a passion of hers because there’s no greater experience than meeting new people, feasting on varied cuisines, and enjoying different sceneries. She loves traveling because there is so much unseen beauty in the world. It’s a humbling opportunity to be able to witness so many unique cultures and ways of living. Her travel goal is to see and live in as many countries as she can, while learning new languages, and hopefully sharing some of her cross-cultural perspectives with others along the way. Click here to follow Vanna’s travel journey.